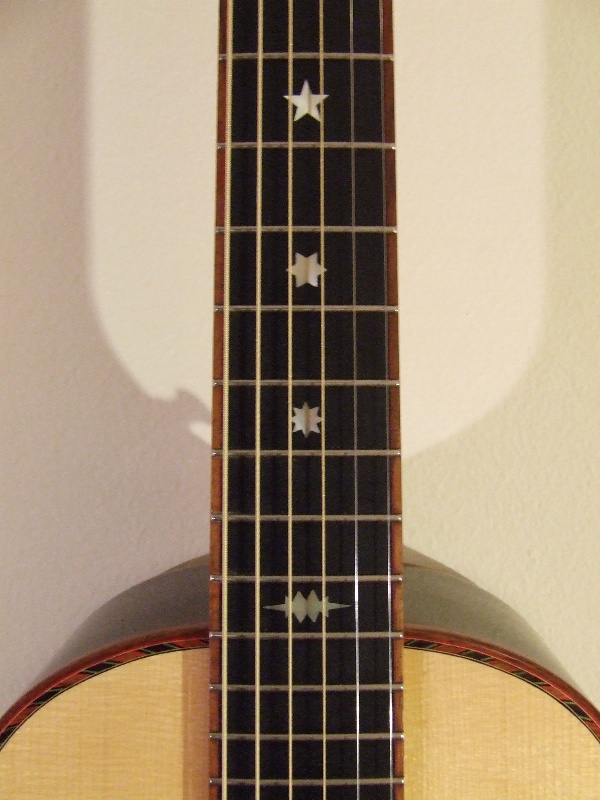 John had this to say about his new custom Ken Miller: "I've had your (now mine!) guitar for about five months and I couldn't be happier with it. The intonation is perfect and the the punch and tone unbelievable. I just put some new strings on and wow! What a cannon! I want to thank you for the care you put into the instrument. Everyone who sees it marvels at its beauty and tone." "I'm picky and demanding when it comes to guitars. I want my guitar to sound sweet and gentle on ballads, gutsy and gutteral on the blues. I want it to ring like a bell for bluegrass and sing out elegantly for swing and jazz. Most of all, I want it to be responsive and loud, so I don't have to struggle to get sound out of it. Only a handful of guitars I've ever played fulfill this requirement completely. 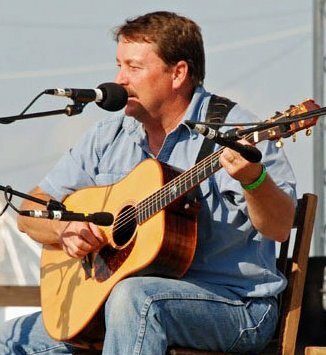 My Ken Miller guitar is one of them, and it has a unique voice which somehow manages to sound traditional and/or modern as the music requires. In addition, it is simply a joy to hear and FEEL it resonate. The neck profile and setup are so perfect that I never even think about whether it's comfortable or not. In the bargain, it's a thing of beauty to behold (thanks in part to Virginia's amazing and tasteful inlay work), and it grows prettier every year as the face darkens. 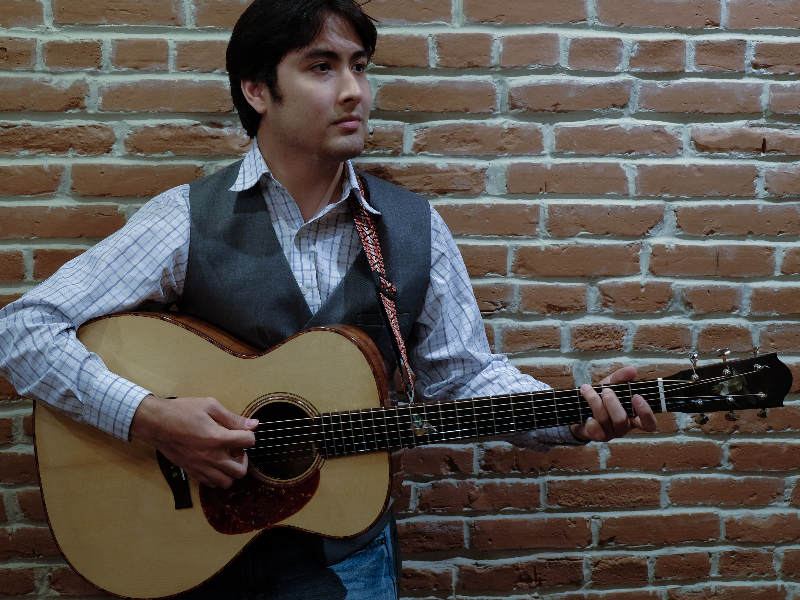 It is one purchase I've never regretted, and one of just a couple guitars which are definitely here for the duration." 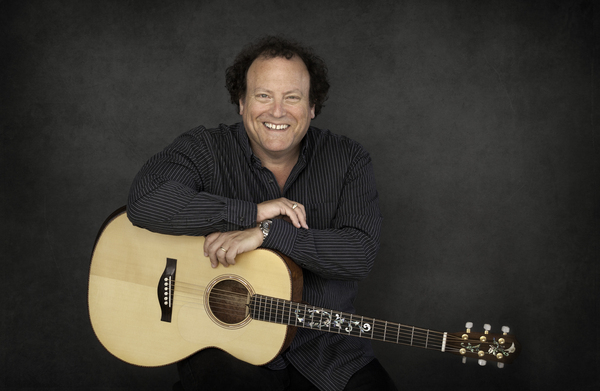 "Last year I commissioned Ken Miller to build me a custom dreadnought guitar. I received my guitar on Wednesday and I want to say a public THANK YOU to Ken and Virginia for building me a Masterpiece. My guitar is made of Black Brazilian Rosewood (back and sides), and is from the same set of wood as Old 97 but with out the orange strip. 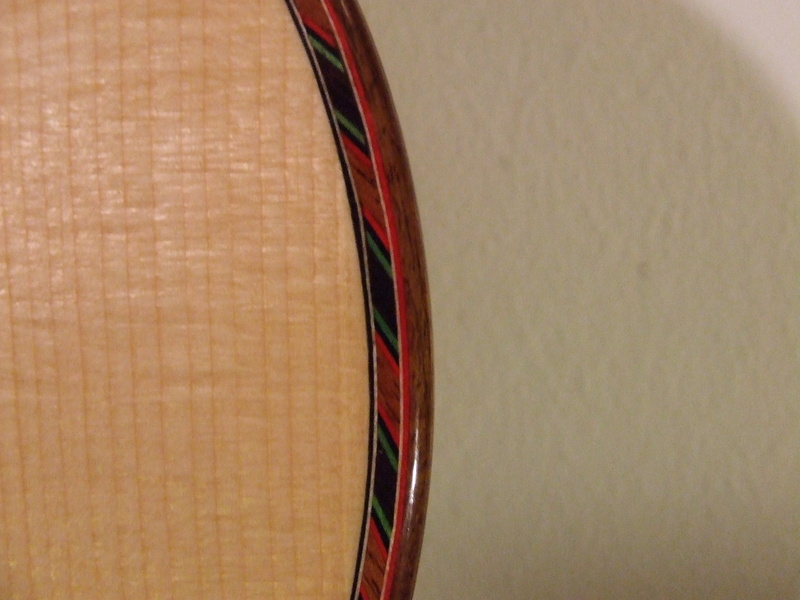 The top is Adirondack Spruce. 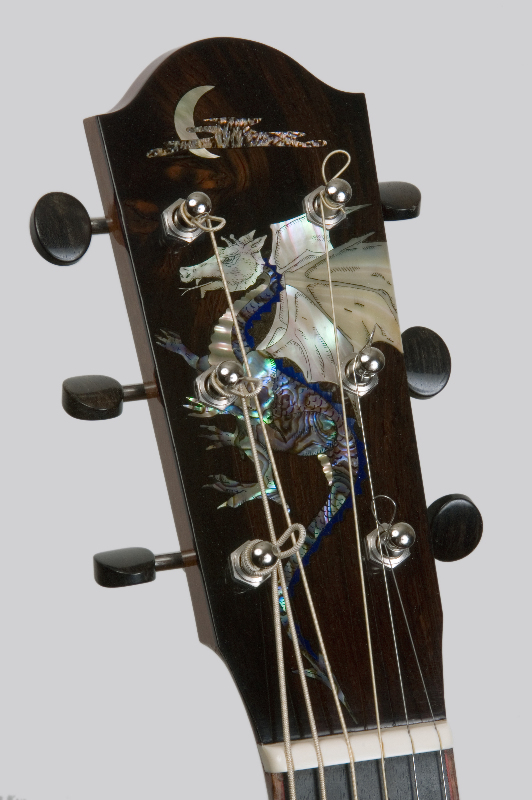 Virginia did the inlay of a Dragon from a sketch I made. When I made the sketch I never imagined that the details would be recreatable but somehow Virginia was able to far out do my expectations for which I am beyond grateful for. 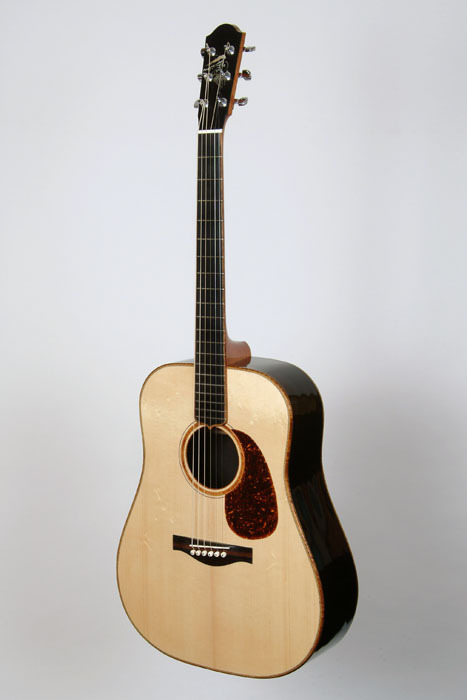 The guitar has a short scale neck which makes medium strings feel like butter and Ken put a small bevel where the right arm rests to make it more comfortable. It is like having a recliner for your picking arm! 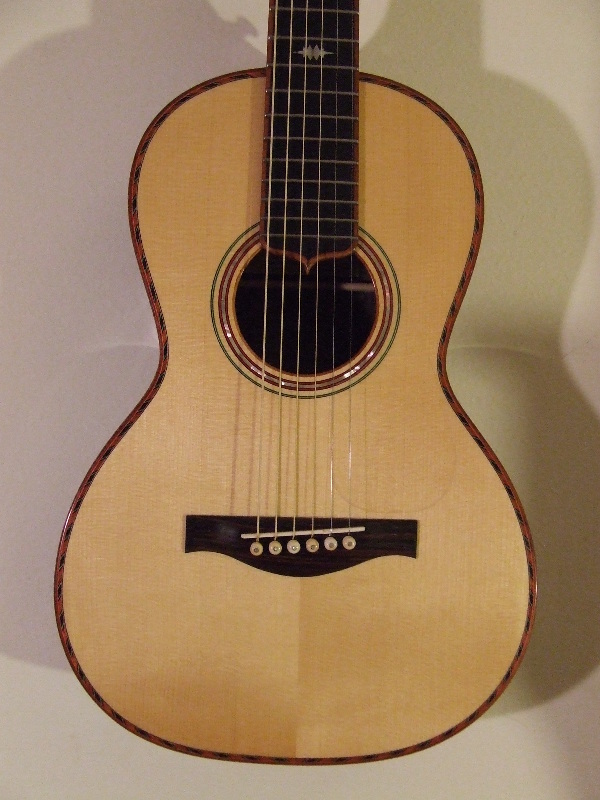 This is the most comfortable guitar I have ever played and it is also the easiest acoustic guitar I have ever played. Like all of Ken's guitars, it is LOUD! It of course sounds wonderful and has that Ken Miller sound. I am very proud to have it and equally overjoyed to have it. It will provide tough competition for my 1939 Martin D18. Again, Ken and Virginia, thanks for making my Dragon come true! Doug Randall on "Old 97"
"Seeing Phil Anania's glowing account of his new Ken and Virginia Miller creation -- #108 : Dragon -- I am moved to report on its sibling, Old 97, which I have had in hand for the past 14 or 15 months. And that's where it has been -- literally -- for most of those months: in my hands being played and played and played, and then played some more. Since I have a couple of fine alternatives from which to choose, I keep coming back to Old 97 because I really like the way it plays and the way it sounds. It has also become my in-house cure for GAS. Whenever I get to thinking about maybe purchasing another, I just pick up Old 97 and realize how futile it would be to try to find something better. 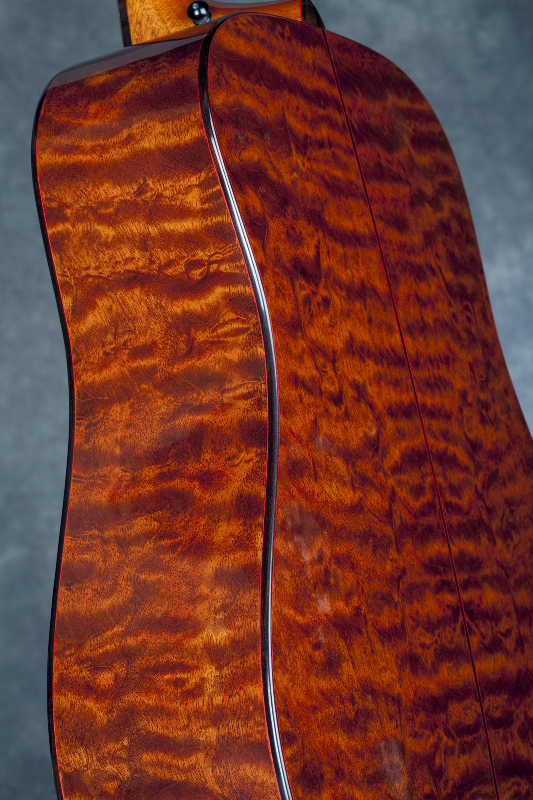 There are so many great guitar makers (not to mention makers of great guitars) who frequent this list, and I am incredibly pleased and proud to have one of Ken and Virginia's finest right here. Phil, if your Dragon 108 is anything like Old 97 -- and I'm confident that it will not be lacking in that old Miller Magic -- you've got a real winner on your hands. Pick it in good health." 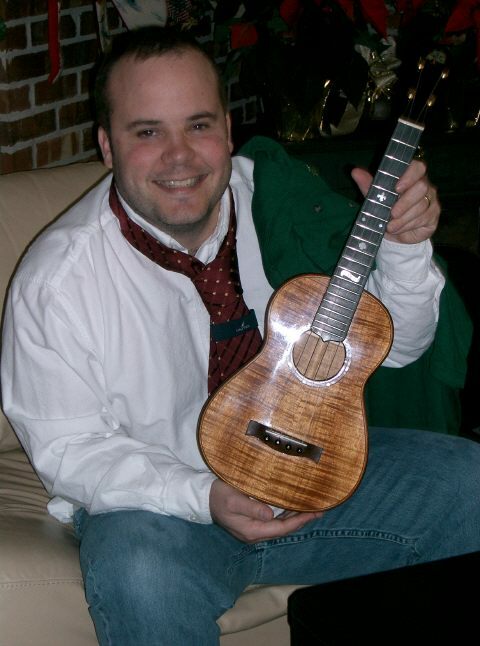 I have a breathtakingly beautiful, magnificently brilliant, hand-crafted custom built Ukulele which has a label in it that says, "Kenneth Miller". This Kenneth Miller must be some sort of mythical dragon because only a dragon could build such an exalted musical piece. There really are no words that do this instrument any justice. 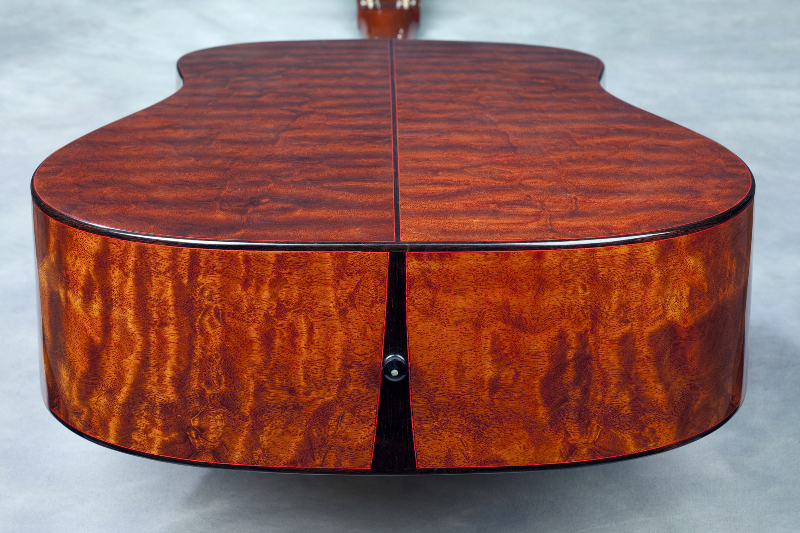 One really has to see it, hold it, smell it, and strum it's strings to fully grasp the meaning of expert craftsmanship. Simply put this musical instrument is amazingly beautiful and sounds like a million dollars. Thank you both for all of the time and effort you put into building what I'll call the Eudy Ukulele. Thanks again for an awesome musical instrument. I want to thank you again for the wonderful guitar you built me. Every time, I play it in a jam people comment on its beauty and its tone, not to mention the fact that it is loud. I've never played a mahogany guitar with a bass response like #105. Thank you again for all the care and attention. 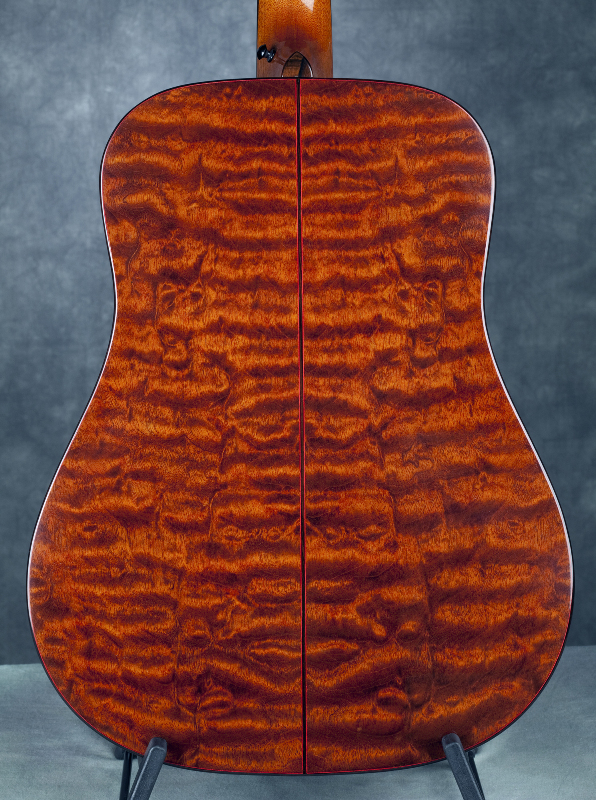 Mary bought a Ken Miller quilted mahogany dreadnaught for me a couple of years ago. 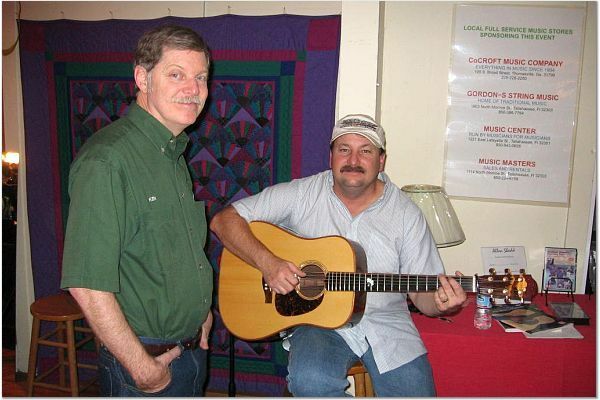 It is far superior to the Martin and Gibson guitars we have had and comparable to the very expensive pre-war Martins owned by a friend who is a collector. 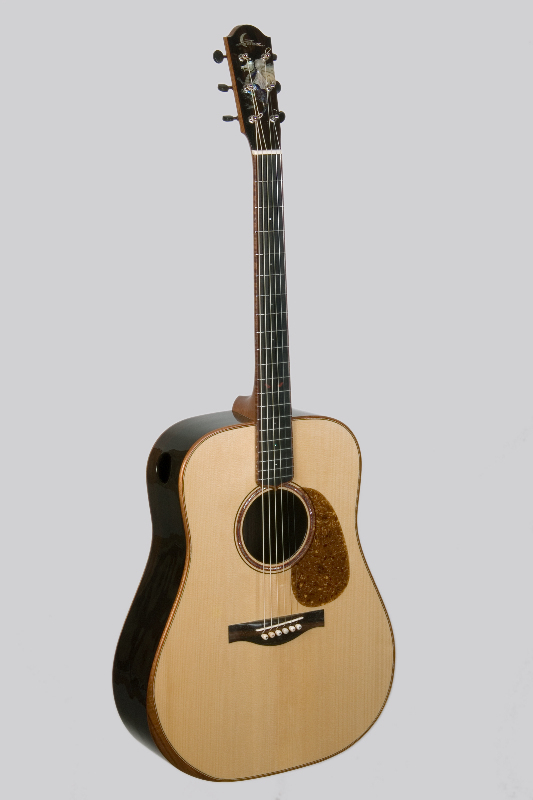 The sound is crisp and clear and the volume is exceptional even with light gauge strings. I can easily be heard even playing with several banjos and fiddles! The guitar is very easy to play and frets true up the neck. I couldn't be more pleased. I have a Martin D-21 from the 60's. 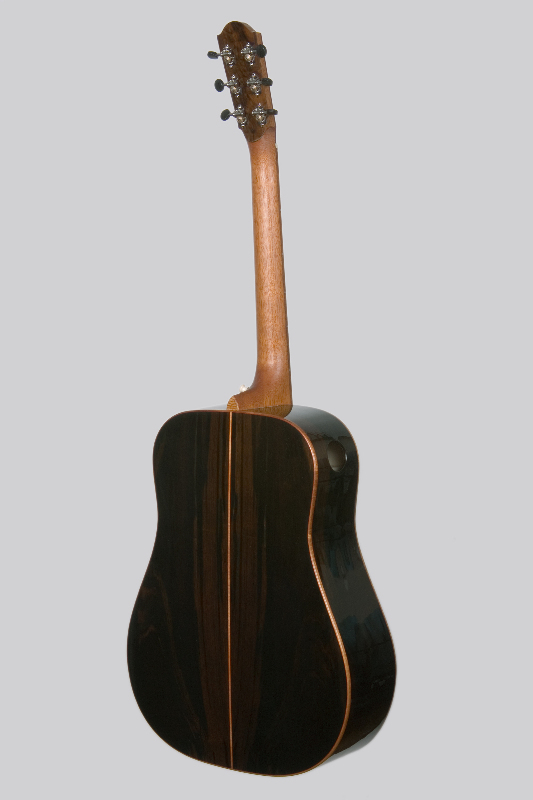 This was one of the last made from old growth coastal Brazilian Rosewood and is considered collectable and was valued at $3,000 ten years ago. Ken did extensive work on it for me which made it easier to play and much louder. However my Ken Miller guitar totally blows it away. 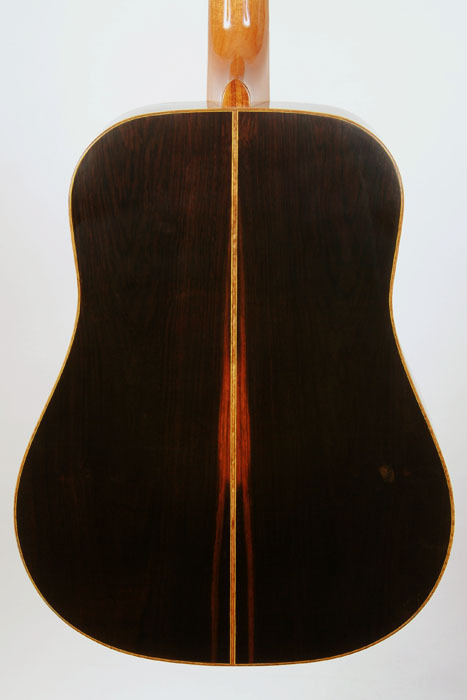 I have played very expensive pre-war Martins which come close and a variety of other guitars, but have played nothing better IMHO. 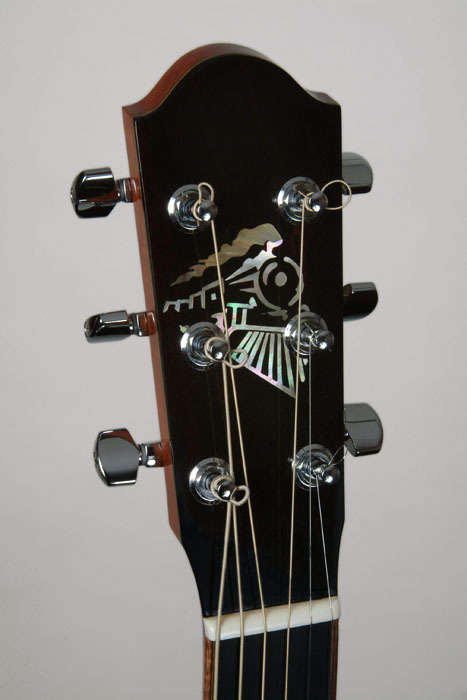 It is a beautifully made and tastefully ornamented guitar with spalted magnolia around the sound hole and an Anhinga inlayed on the peg head. 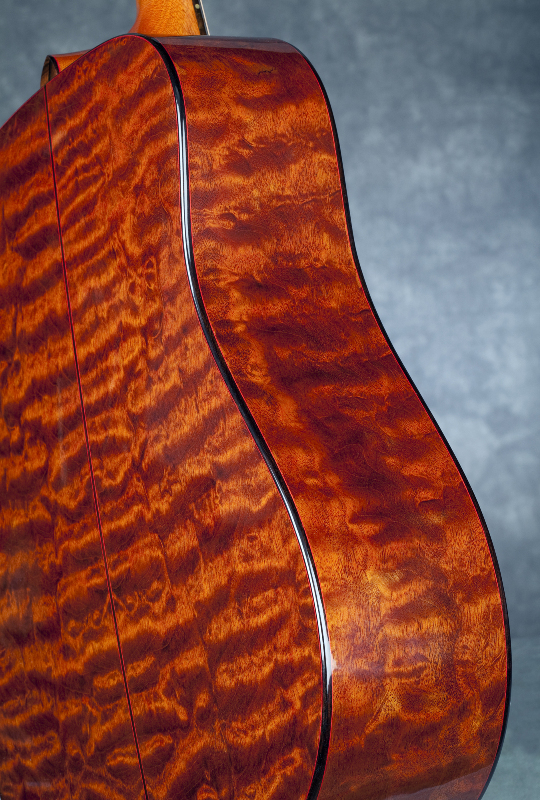 The quilted mahogany is very beautiful. 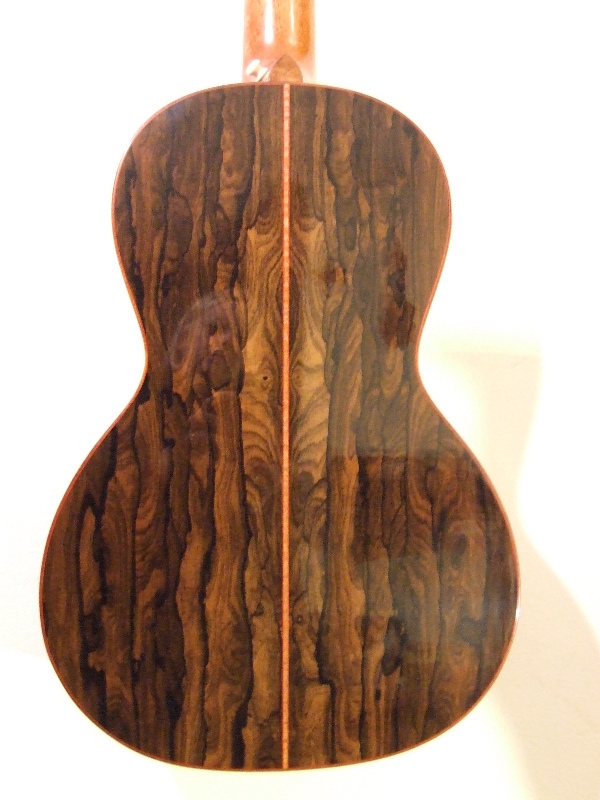 If I ever get another guitar it will be another Ken Miller, probably with a different wood for variety. On the other hand if I never get another guitar it won't matter because I am so pleased with the one I have. 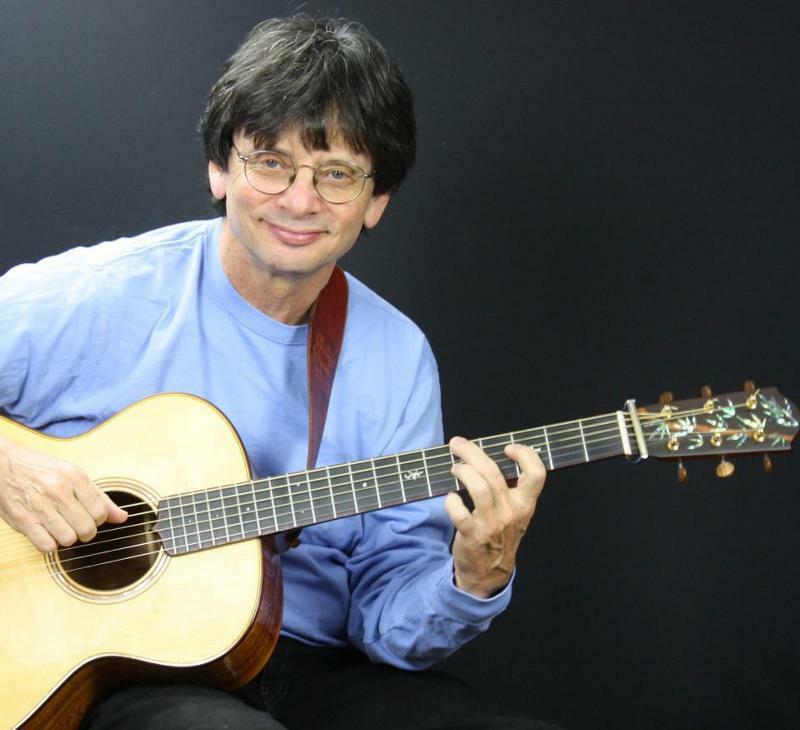 Here is a bit of his advice on choosing the perfect guitar for his Zen method. # Go into the world and find the instrument that’s waiting for you, the one you are meant to play. # There’s an instrument for everyone. # What’s important is that when you pick it up, it makes a sound that’s beautiful to you. # Avoid poor craftsmanship; it’s a sign of a poor spirit. # Learn to identify quality and appreciate anything that’s well made, wherever you find it. special guitar filled with wonder and special tunes. —it still has a full bodied guitar voice. 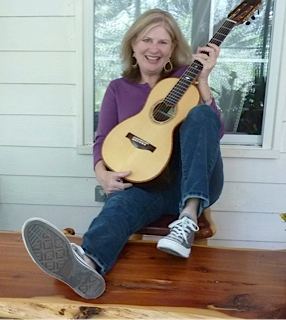 I can gently touch a note and it rings out loud and clear — perfect for a student of Zen guitar. 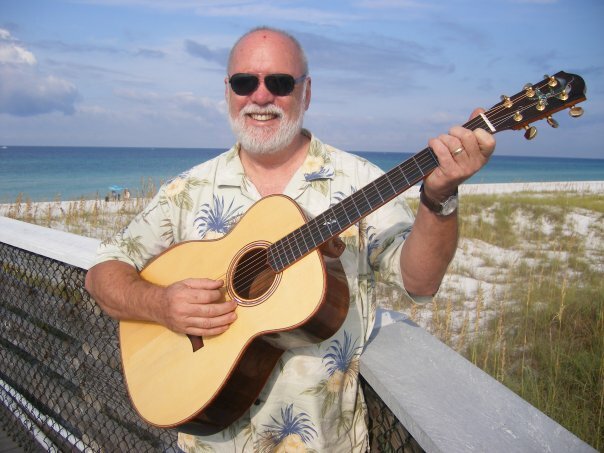 Thanks so much Ken and Virginia for building such a spirited and wonderful guitar pal for me.